After Monday’s somewhat heavy post, I thought I should assure you that I’m not just sitting around steaming about politics all day. I’m also dreaming of travelling. As the weather becomes increasingly spring-like (sorry, Ontario-dwellers, if I am alienating you with this statement), the travel bug in me is stirring to life again. Stelian and I were tossing around the idea of taking a trip outside of Switzerland for the weekend in April that covers both my birthday and our first wedding anniversary. Then, as we were discussing it a few days ago, we realized that this weekend will also coincide with Easter this year! Oy vey, we said — everyone else will be travelling then, too. We’d better get to planning. We thought we’d choose from one of three countries which border Switzerland — France, Italy, or Austria. Initially, we had our sights set on Vienna, a city that we have long wanted to visit. But then, we thought it’d be nice to go somewhere a little less urban. And it’d be nice to be near a body of water. So, we decided on this. The Cinque Terre are five villages in the Liguria region of Italy, strung along cliffs bordering the Mediterranean, and connected by hiking paths. The region is both a National Park and UNESCO World Heritage site. The villages are car-free (that always sounds so good to me as someone who has never owned a car) and the area is known for its pesto production. We look forward to hiking and eating and generally just soaking up the calm ambience of Italy. We both adored Tuscany when we went in 2008, and I’m sure we will love the Cinque Terre just as much when we visit next month. So let’s talk travel. What trips are you planning, or dreaming about, in 2011? If you’re currently travelling or already have travelled, what have been your best experiences? Please share in the comments! 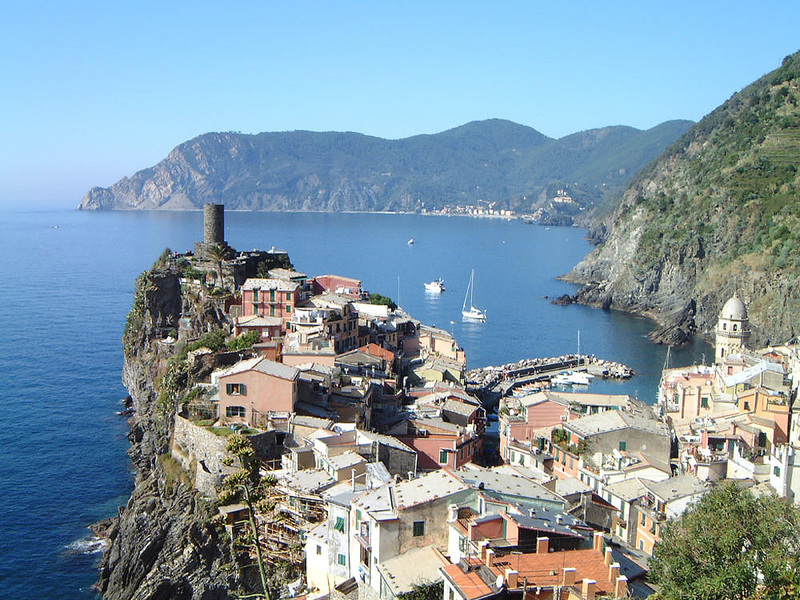 The Cinque Terre area seems so interesting! I’d wake up every morning paranoid that my house was precariously perched on a cliff though 😀 I know I really enjoyed Italy when I was there (even the obtuse and arrogant drivers screaming at each other provided some fun spectacles!) I would love to go there with you guys! But alas, I will be writing my final exam on the 27th of April. But… I have a trip to Cuba planned! I am going to stay in a resort near the city of Camaguey, Cuba’s 3rd largest city, also a UNESCO world heritage site. The town of Camaguey itself was founded in 1515, only to be moved inland in 1528 due to the constant threat of piracy. They built blind alleys and many forked roads in the city, in the hope of entrapping any invasive threat in a labyrinthine maze so that they could easily take them out. I think it’s going to be really cool to visit that city and spend some time there! Hey, Pat — we’ll think of you studying while we enjoy Cinque Terre. And your trip to Cuba will indeed be a well-deserved graduation present. We can swap pics of our respective trips, and travel vicariously. Great quote at the end of your comment! 5 nights in Ucluelet during Spring Break with Ken, Joan, Paul, Darlene, Jordan, Megan, Jessie (woof! ), and Chili (cheep!). Right on the ocean (Terrace Beach), surfing, hot tub, dog-friendly, bbq on deck, sound of rollers coming up the shingle beach. Ahhhhh! Sounds great! Is Spring Break over already? Or are you there now? I love how even Chili gets to go to the beach! in april I’m hoping to get out to paris (for the first time!) for a few days with the mister – exciting times! Ooh, Paris in the spring…you will love it. We went there in May, also in 2008. Beautiful, and so many good things to eat. The highlight of 2009 for me was Venice. It has a character unique from all the other places I’ve visited. When I went in September 2009 they were experiencing a foot or more of flooding each day. Every afternoon the fancy chairs in front of fancy cafes were cleared and crude wooden benches were erected. Unknowing tourists sat on them, thinking they were placed there as a courtesy. By the mid-afternoon the stunning Piazza San Marco was filled with canal water. Walking the rickety benches was the only way to cross the square. I loved the the Basilica San Marco. (If you do not have an image in your mind’s eye, pause for a quick google). This is where the romance of Italy meets Byzantine architecture. The beautiful dome and stunning mosaics are well worth the wait to get inside. Presently I have my sights set on the East. This summer I will be travelling east of the old Berlin wall for the first time. Czech Republic, Slovakia, Hungary, Poland, here I come. Someday I hope to visit “the Venice of the East.” In fact many cities have given themselves this nickname but in my heart there is only one: Bangkok. Maybe Patrick will decide to travel there, and give me a reason to visit! Yes, Ligurian food is seafood-based. There’s also supposed to be excellent foccacia and pizza. Can’t wait! We do still have to get to Venice — I’m sure we will before too long. It looks so beautiful, but I’m somewhat scared of the hordes of other tourists (this was the reason I didn’t so much love Rome). I’m glad I’ll be seeing you after your tour of Eastern Europe. Looking forward to your pics and stories! It will be fun to host you…and since you’re here for a week, we should be able to travel to any cities in Switzerland that you want to — everything is a few hours by train at most. I haven’t yet seen cities like Bern, Lucerne, or Geneva, and might still not have by the time you visit! The Cinque Terre look amazing. What a setting! It will be a great experience. Italy is easy to love. And the food……. We have just arrived back in Melbourne after a few days riding on the Great Ocean Road along the south-east coast of Australia. Wow!! Windy, wavy, wild. Much like the Pacific Coast in northern California. This is our second pass through Melbourne. The first time we stayed with friends in a suburb at their home on the coast in Black Rock. A heavy influence of Mediterranean architecture in that area along the coast reminded us of Italy. Now in the inner core, we are appreciating the mix of modern with Victorian – there is a hint of New Orleans too in the two story dwellings with balconies and ornate iron work. Most impressive of all is the activity here – bike lanes everywhere. On the weekend we saw (truly) thousands of riders in separate pelotons of about 25 each. One lane of the beach road (runs about 25k) on each side was dedicated to them on each of Saturday and Sunday morning. There is a bike and running path suspended over the Yarra river providing access into the city for riders. This is very neat – running/riding on two lane path suspended about three feet over the river. And runners everywhere. People are fit and outgoing. The population is very multi-cultural. We are very impressed with this city. We have had a taste of pretty much everything here over the past weeks – desert, mountain, ocean, urban. The fact that there are wine regions all around is a happy bonus that rewards each day of riding with a nice bottle of Shiraz. And we have picked up that Aussies do not say “no worries” as often as we expected; more common is the greating “how ya’ goin” which really doesn’t expect an answer it is more like hello than a question. Ciao. Wow…you make Australia sound mighty appealing — sounds like it’s got most everything a person could want. And I guess I’m not surprised that Aussies have moved on from “no worries” now that the rest of the world has latched onto it. When Stelian and I were on Maui, the word from surfers/young people we encountered was “Howsit” — a very abbreviated “how’s it going?” This, too, was used as a general greeting rather than an actual question. I love learning regional slang…I’m sure Patrick knows a lot of it after his time in Barbados. Yes, we are going to enjoy some, not all, of the activities at Ucuelet which Paul mentioned- maybe not surfing!! Boppy has been cooking up a storm so dinners can appear like magic (in a hurry if we are late getting back). We will think of you on your birthday/anniversary in sunny Italy. What a great idea to visit those clifftop towns! We will be leaving Vancouver aboard the Zaandam heading for Hawaii. This is a favourite cruise, 5 days at sea, 5 days visiting the Islands and 5 days back to Vancouver. One of the best things about the trip is not having to fly anywhere, especially at that time of year. Ferry and bus work just fine, as you know.